Home > Collections and Multi-Buy Offers > 3 Evergreen Pyracanthus In 3 Colours - Red, Orange and Yellow all from the NEW SAPHYR Range of Stock. 3 Evergreen Pyracanthus In 3 Colours - Red, Orange and Yellow all from the NEW SAPHYR Range of Stock. Description: This is a collection of 3 colours from the SAPHYR � Range of Pyracanthus reaches a spreading shape of 2 to 4m high and a spread of about 2m. The growth is medium to vigorous depending on the variety; it is naturally upright and one of the strong points of this range is that they are particularly suitable when grown as hedges as the can be pruned. (Secateurs are recommended). The foliage is shiny, evergreen to semi-evergreen. The branches are spiny. Selected for their resistance to fire blight and scab, these varieties flower abundantly from May to June, on the previous years growth, Numerous coloured berries are borne in autumn which last a good part of winter: SAPHYR � Yellow 'Cadaune', very vigorous, bears, from mid- October, numerous yellow berries, which last a long time, later turning more orange. SAPHYR � Orange 'Cadange', vigorous, bears orange berries in mid-September. 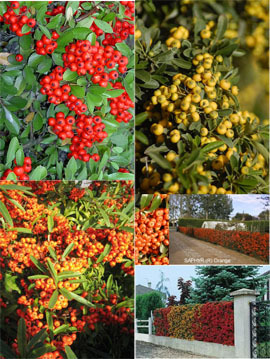 SAPHYR � Red 'Cadrou', Medium growth, bears numerous large red berries from mid-October, finally turning Uses: These ornamental disease-resistant varieties are excellent for a defensive hedge (pruned to 1.5 to 2m) or left to grow. They can also be grown with other shrubs in beds. They can also be trained on walls, fences... Pyracantha (firethorn) are hardy evergreen wall shrubs that look beautiful all year round. They feed wildlife and attractive to bees, butterflies and birds. They will grow in a wide range of positions to full sun to partial shade and thrive in most soil conditions. They are also ideal for keeping out the most determined un-wanted visitor due to their strong thorns covered by shiny green ovate leaves. In late spring, it bears clusters of white flowers that are followed by a large number of berries in autumn into early winter. Also has the benefit of being drought tolerant, requires low maintenance, and tolerates air pollution. Colour: striking red, Orange and Yellow berries Hardiness: fully hardy Other features: good disease resistance. Ideal to deter intruders.